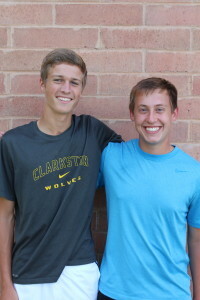 Seniors Tristan Greenlee and David Carpenter changed Clarkston Boys Varsity Tennis history by winning back to back tournaments on the Doubles No. 1 court. “It was pretty exciting,” said Greenlee. They won the Traverse City Invitational and Clarkston Invitational which they explained they went against good teams and good competition. “It was probably our hardest match,” Carpenter agreed. Both begin playing tennis when they were in elementary school. Carpenter stopped playing for a few years as he tried different sports. Greenlee stayed with it because he found it enjoyable especially with the boys he grew up playing tennis with – who are still on the team with him now. Greenlee and Carpenter became a doubles team during their junior year and said the chemistry is awesome. Their goal for their final season is to qualify for the state finals.